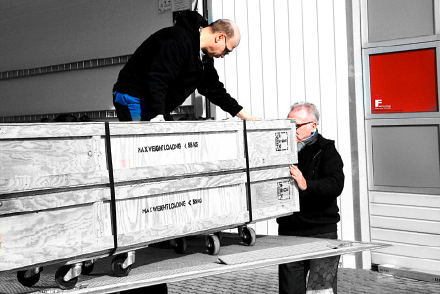 Low-weight, visual solutions, easy to assemble and to transport. 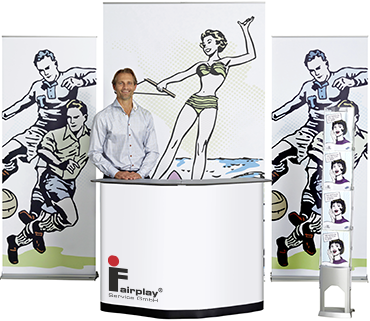 Roll-ups, banner-displays and brochure stands. Visual Solutions, easy to assemble and to transport, resilient and durable. 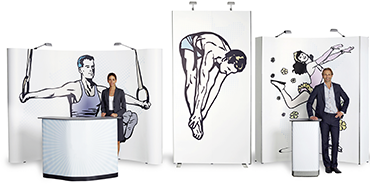 Pop-Up Displays, Picture Canvases, folding Systems and Exhibition-Ready Solutions. 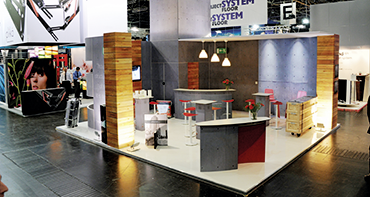 Modular and reusable fair stands, Standard- configuration and custom made solutions from 9 to 100 m2. To be assembled from our professionals. Broadsheet print in various forms and on various materials. 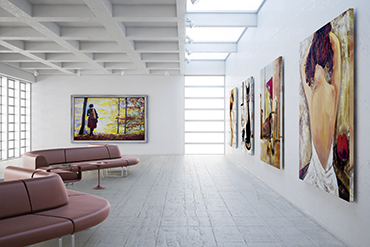 Classic on canvas screens or on modern Forex as well as aluminum band and acrylic glass. High resolution execution quality, strung on almost invisible frames. Optimal color resolution thanks to Subliminations technique, perfect covering, in an abundance of forms and formats. 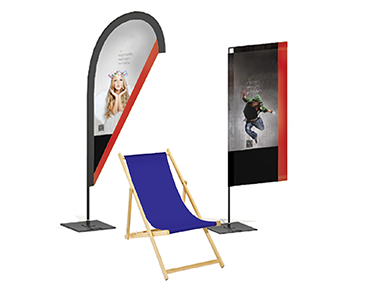 Beach flags, Foldable Systems, Commercial Banners in various options. Displays support the merchendise presentation. That is why the „look and feel“ can stand out from the classic program. The presentation-display is should halt the client at the POS, spark their interest and promote the purchase. The execution can happen in various materials, from firm cardboard over acrylic up to steel and aluminum- constructions- as well as natural materials such as wood for example. The marketing display is usually an invitation to touch and experience various materials. Also to illustrate complex, not neccesarily obvious processes and optimal facts. Upon your request we are able to develop customized prototypes for the testing market and support you in the serial production and the extensive equipment of show-roomsand Flagship-stores. The selection of our products include light-displays, back-lit textile frames, digital steles, posters as well as many other options. 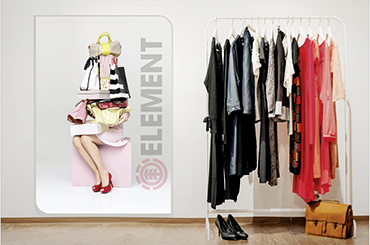 With a combined sales-display you’ll reach the client at various standing points. For that we often integrate monitores into classic displays, so the presentation covers not onlez the visual but also the haptic accents. An example could be the combination the presentation of a product sample and the company video. Wether in hotels, on the companies premisses, the busstop or inside of stores- the usage of digital signaging becomes more popular. Our digital signaging solutions are linked, audio-visual digital dispalys for the presentation of advertisement and further information. In combination with internal and external media databases, you can manage the campaign-data centrally and inject information safe and secure. The displays are controlled via WiFi or UMTS. To ensure the display of the campaign simultaneously at different locations. The update happens centarlly and uncomplicated. Alternatively, the data communication can also happen via USB-Sticks, right at the device – the „plug&play“ option. For special requirements and per request of our customer, we are abale to develop a prototype for the testing market, which after completion oft the test runs, aquire series maturity. Our promotional atelier supports with layout and data preparation for print-, online- as well as other digital media. 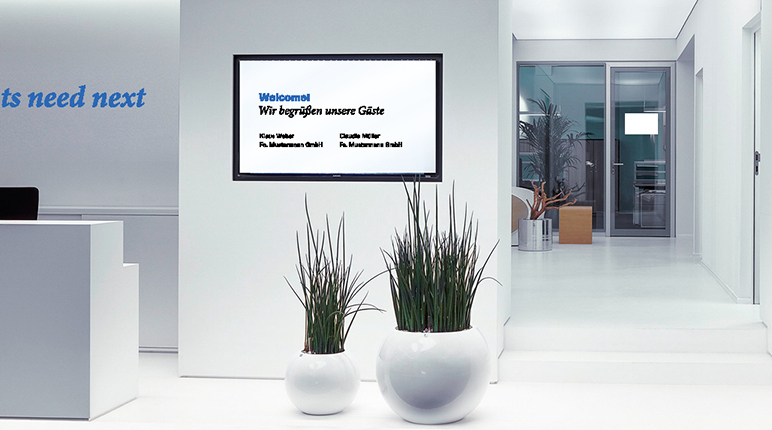 Our IT-experts ensure the optimal compatability oft the soft- and the hardware, so your digital displays portray the right advertisement information at the right time. Media planing just in time and at the push of a button! 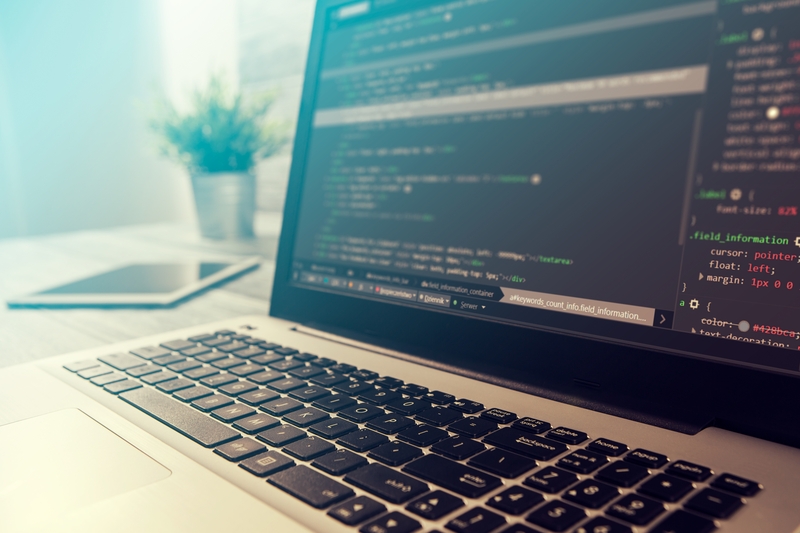 Software solutions have to be one thing these days: simple. Simple in the handling. Simple in the installation. And always available. 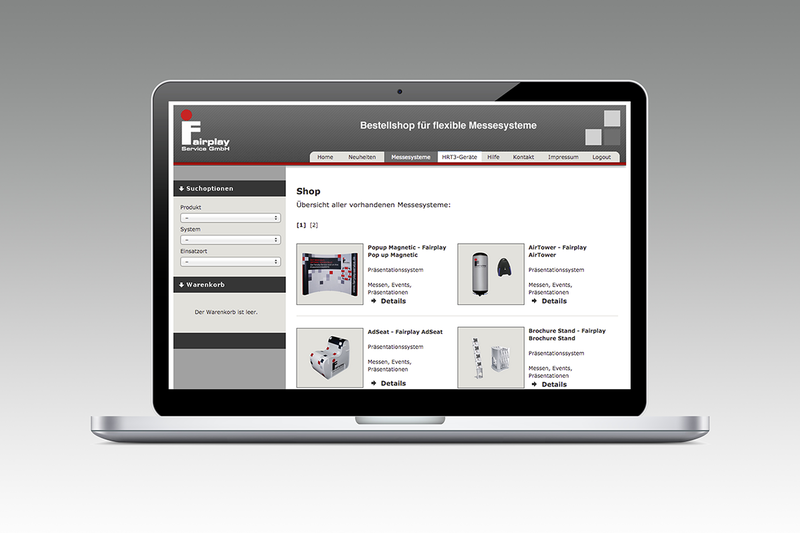 At Fairplay Service we use tools, that support your employees – indipendent of location and time. Concepted and excuted as a web application, broad upgrades as well as updates are realizable. Our tools contain exactly the functions, that your employees need to do their job, through the modular assembly and the role concept. Modern warehouse administration under implication of mobile devices, ensure the registration of all incoming and outgoing merchendise. This includes a higher transparency over the orders and deliveries as well as improved profitability thourgh optimisation oft he routes, expediting oft he processes and error reductions. Optimal interlocked workflow applied to your individual projects. From the order process all the way to the returning management. 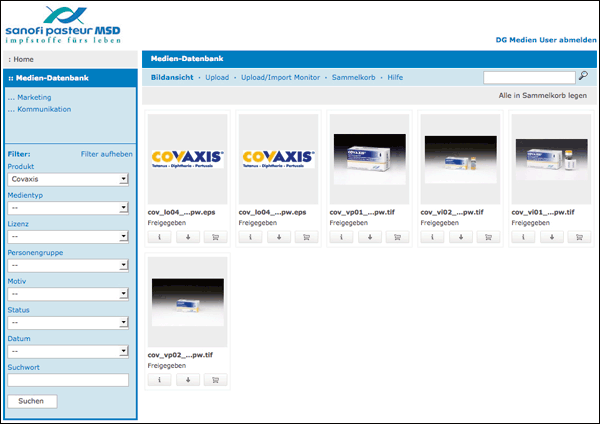 Here you can display all processes and analyses and your employees are provided with an updated overview at any time. Our systems for central media management provide the managing of various picture and video formats. 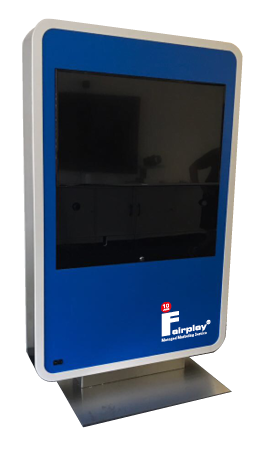 On the basis of the Fairplay developed aspect:ratio frameworks, we provide a functional and simply extendable media data bank for pictures and videos. 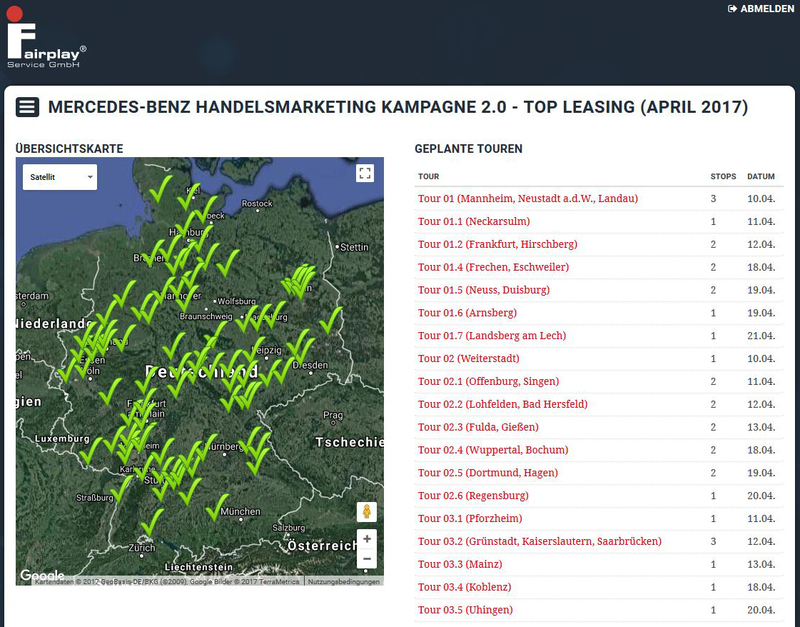 Our tool for tours and applications planning is implemented as a web application. It functions on stationary as well as mobile devices (Android and Apple). The main task oft the tool is the project- and employee management at the POS, in regards of merchendising- and promotional measures. Further blocks oft the system are routing, receipt compilation and project documentation, with pictures and checklists. An ideal instrument for promotion- and event agencies, which can be customized to new projects with little effort.